Minister of Information and Broadcasting Dora Siliya has today told parliament through a Ministerial Statement that the Times of Zambia is ‘bankrupt’ and resorted to writing articles in Chinese (Mandarin) in order to attract foreign (Chinese) commercial businesses. Siliya was responding to a point of order that was raised on Wednesday 10th October 2018 by Monze Central Member of Parliament Jack Mwiimbu alleging that the Times of Zambia was discriminating against Zambian local languages by publishing some articles in Chinese. She said as of 30th September 2018, the Times of Zambia had 286 employees with total assets amounting to K286 million with liabilities of K748.5 million. Siliya further explained that the Company was technically insolvent with a negative asset value of K662.1 million adding that it had salary arrears ranging from 3 to 10 months for different categories of workers. She stressed that in 2015 the Times of Zambia board begun to explore various ways in which to raise resources for the company and among the strategies was to attract new business through subscription and advertising targeted at new commercial communities in Zambia such as the Turkish, French and Chinese. ‘It is in this regard that the decision to translate and report some selected stories in Mandarin (Chinese) was arrived at,’ Siliya explained. And Liuwa Member of Parliament Dr Situmbeko Musokotwani charged that the Times of Zambia was trading illegally because it was against the law for a company to continue trading when it was technically bankrupt. 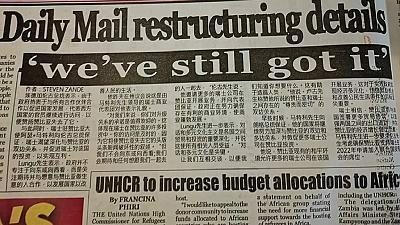 ‘Do you honestly believe that just by putting few adverts in Chinese, this is what will address the key issue facing Times of Zambia and not closing it as you closed the Post Newspaper because of being bankrupt,? Dr Musokotwani wondered.